1. Place the flour, caster sugar, baking powder, cocoa powder and salt in a large mixing bowl and mix. 2. In a separate bowl beat together the eggs and milk. 3. Add the egg and milk mixture, as well as the vegetable oil and vanilla essence to all of the dry ingredients and mix together well until all lumps have disappeared. 4. Pre-heat your Waffle Maker and add some sunflower oil spray, to the baking plates to eliminate the possibility of sticking (a thin layer of butter/margarine can also be used). 5. Use one ladle of your waffle mixture and gently pour to the centre of the bottom plate. The mixture will spread to the edges itself; do not use more than one ladle of mixture as the waffle will expand with cooking. 7. Leave for 7-8 minutes and check for browning around the sides of the waffle. It may need to be left for a further 1-2 minutes. Once you are happy can switch off machine and leave to cool for a few minutes before removing with a wooden or plastic utensil. 8. 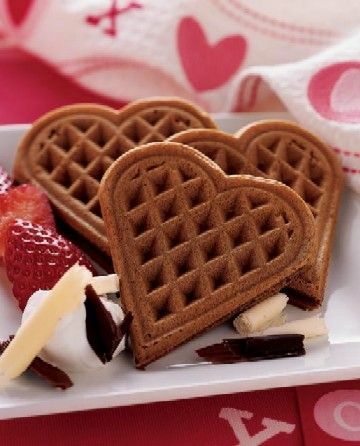 Decorate your waffle as desired.